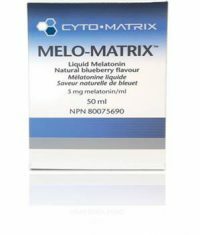 Melo-Matrix™ is a high-quality, fast acting liquid melatonin. The light blueberry flavoured liquid is easy to administer in incremental volumes, making it suitable for many adult sub-populations. Melo-Matrix™ helps increase the total sleep time (aspect of sleep quality) in people suffering from sleep restriction or altered sleep schedule, e.g. shift-work and jet lag. Melo-Matrix™ also helps to reduce the time it takes to fall asleep (sleep onset latency aspect of sleep quality) in people with delayed sleep phase disorder and re-set the body’s sleep-wake cycle. Adults: Take 1-2 mls 1 time per day at or before bedtime. Do not drive or use machinery for 5 hours after taking melatonin. Duration of use: For use beyond 4 weeks, consult a health care practitioner. 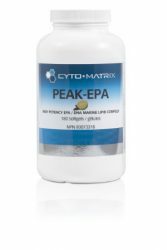 Peak-EPA™ is an excellent source of EPA and DHA for the maintenance of good health. The high level of EPA:DHA per gelcap helps maintain cardiovascular health and reduce serum triglycerides. It helps promote healthy mood balance and in conjuction with conventional therapy, aids in reducing the pain of rheumatoid arthritis. In children up to 12 years of age, Peak-EPA™ helps support the development of brain, eyes and nerves. Take 1 gel capsule 3 times daily or as recommended by practitioner. Omega-D3 Liquid Forte™ is a highly concentrated EPA:DHA (2:1) with an additional 1000IU of Vitamin D3 in just one teaspoon. This light tasting oil is delicately flavoured with a natural citrus; pleasing to even the most discerning palate. Take 1 teaspoon once daily or as recommended by practitioner. Take 1 tablespoon once daily or as recommended by practitioner. L-Glutamine is the most abundant and utilized amino acid in the body; widely used to provide nitrogen and fuel to rapidly dividing cells. Glutamine has beneficial effects on gut inflammation and integrity, outcomes in cancer and critically ill patients, infection control in surgical patients, performance in endurance athletes and wound healing. Each dose delivers 5 grams L-glutamine.